We’d love your help. Let us know what’s wrong with this preview of October Nights by DeAnna Knippling. 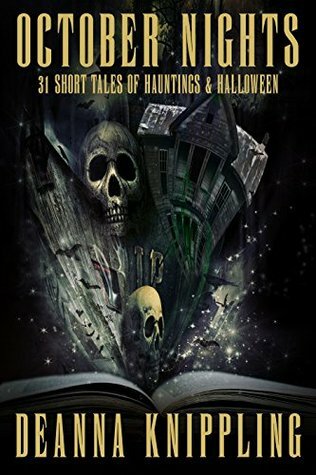 Thirty-one short horror tales of ghosts, haunted houses, vampires black cats, mad science, weird plants, demons, zombies, and Halloween. From the surreal to the gory, surprise twists, black humor, bad puns, dark dreamlands, old myths, thrillers, chillers, and illers. Twilight Zone stories, dark fantasy stories, Black Mi SPOOKY SHORT FICTION - PERFECT FOR A HALLOWEEN NIGHT! Thirty-one short horror tales of ghosts, haunted houses, vampires black cats, mad science, weird plants, demons, zombies, and Halloween. From the surreal to the gory, surprise twists, black humor, bad puns, dark dreamlands, old myths, thrillers, chillers, and illers. Twilight Zone stories, dark fantasy stories, Black Mirror stories, and far-future dystopias. To ask other readers questions about October Nights, please sign up. Initially not sure what to expect with a collection of flash stories (any author knows they are hard to write), I found her style and presentation of these world snippets fascinating. They hove This year I really did not get a chance to participate in any Halloween writing. Though not my favorite genre, I do enjoy writing a scary story. Still wanting to get my fix, I decided to try out Deanna Knippling's October Nights: 31 Tales of Hauntings and Halloween. Suffice to say, I was not disappointed. Thirty-one horror tales of ghosts, haunted houses, vampires black cats, mad science, weird plants, demons, zombies, and Halloween. From the surreal to the gory, surprise twists, black humor, bad puns, dark dreamlands, old myths, thrillers, chillers, and illers. Twilight Zone stories, dark fantasy stories, Black Mirror stories, and far-future dystopias. Short & sweet…monsters & meat. This was a neat little collection of short horror stories. They were well written, but just way too short! I would love to see some of these made into longer novella or novels. Some were a bit confusing, as they were just too short. It would be nice to see the Vampire Lady and Trick or Treat made into a full novel. All in all, nice little stories, but not too much of horror for me.